The annual May pilgrimage of the Hampstead Pals started off in great spirit from the Bushey Metropolitan Police Sports Club at 7.00 a.m. on Sunday 15th May. Everyone actually turned up on time, so we were lucky enough to arrive in Dover to catch an earlier ferry and so berthed at Calais at noon. Our guides were Jon Nicholls and Clive Harris, who hugely enriched the tour with fascinating anecdotes about incidents in the Great War, especially of acts of heroism. Our first stop was Loos Battlefield, stopping first at Dud Corner, & The Loos Memorial to the Missing. So called because when it was taken, a huge number of British unexploded shells were discovered at the site. From there we went on to St Mary’s ADS (Advanced Dressing Station) and gathered round the gravestone where John Kipling, son of Rudyard Kipling is said to be buried. John Grieve CBE gave an excellent presentation on the ongoing mystery of John Kipling and cast an expert detective’s eye on his disappearance. It was very windy and quite cold. Nevertheless we enjoyed a picnic with some good red wine and held a book raffle. En route to our hotel we took a detour to visit the huge Canadian Memorial at Vimy Ridge, which contains the names of the 11,000 Canadians missing in France during the Great War. This stunning memorial, was designed by Sir Walter Allward. It is said the vision of the twin pillars came to him in a dream. From there we continued to the Hotel Moderne in Arras, with everyone heading straight to the bar for a drink. Monday morning dawned to high white cloud, with quite a bit of blue sky, but by 9.00 a.m. it became overcast with a chilly wind that was to stay with us for the whole day. Our first excursion was to the beautiful, Arras Memorial to the Missing, which has the names of 35,942 war dead out of the total of the 158,000 killed in the Battle of Arras. This was one of the fiercest battles of the Great War, which lasted from 9th April until 13th May 1917 with an average of 4,076 casualties a day – absolute carnage. 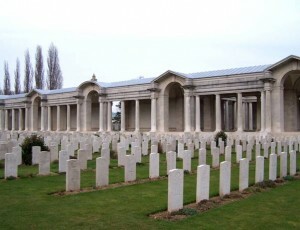 Also in this cemetery is the lovely memorial, which commemorates the missing of the RFC and the RAF during the Great War. Here, at the Arras Memorial, the gardens and the lawns were immaculate, thanks to the Commonwealth War Graves Commission, a fitting tribute for those who died for us. From Arras, we out onto the battlefields and to the tiny cemetery at ‘Happy Valley,’ which had 76 graves from the battles of 1917. In this remote corner of a foreign field, is a young man, Albert Brown a company sergeant major age 21 with a DCM and MM. There we had our daily, Champagne ‘Frenzy’ with strawberries, a real tribute of a drink to lost friends who were buried there. The next stop was at Cuckoo Passage Cemetery and an excellent presentation by Mike Jackson and the mystery of the disappearance of many men of the 18th Manchester Regiment on 23 April 1917. It was a real bad day for the British Army. There are only 54 men, mainly of the Manchester Regiment, buried here. By now there was a very strong and cold wind, which had a number hurrying back to the warmth (and the bar) of the coach. Nevertheless, a beautiful, isolated cemetery, which stands on the Hindenburg Line. It gets few visitors. We took our picnic lunch back to the hotel, due to the unseasonable weather for May. (It was the only cold day!) After lunch, we went on to Ontario Cemetery, near Marquion, where was buried Lt Col Charlie Stuart, an ex police officer, who was killed on 28th September 1918 at the age of 44 during the crossing of the Canal du Nord. He was born in 1874, the son of a prominent Nova Scotia family and was expelled from school for gambling. He was an extremely colourful character and a superb athlete. He was a member of the Princess Pats Light Infantry. (Princess Pat was the daughter of the Governor General and 19th in line to the throne.) Charlie Stuart had been awarded the DSO and bar and Croix de Guerre. He was so inspiring, that his men would follow him anywhere. This cemetery contains many interesting characters and highly decorated Canadian soldiers, many of whom were British born. It was interesting to note that the British Army lost more soldiers in 1918, the year of victory, than in all of the previous years of the war put together and most of the dead were aged around 18.